Come summer and Bengalureans can be seen obsessively discussing water, or rather the lack of it. While water tankers bring momentary relief, residents can’t help pondering over the long-term implications of water shortage. To find solutions to the water crisis, the third water workshop organised by ADDA, a company that offers an integrated apartment management software for gated communities, brought to light several ongoing sustainable water management initiatives. 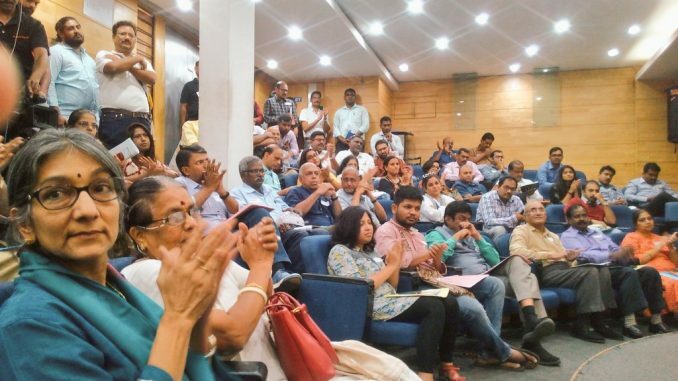 On March 23rd, representatives of Resident Welfare Associations (RWAs), citizen groups and activists met at the The Energy and Resources Institute (TERI) campus to seek solutions to the ongoing water crisis in the gated communities of Bengaluru. On a daily basis, Bengaluru meets its water requirement by pumping water from Cauvery River which is 95 kms away. It is known that, once Bengaluru started receiving piped water in taps, the use of open wells and lakes declined. These water bodies gradually got polluted. The city also witnessed poor sewage management by the BWSSB and apartments. At the workshop, Bangalore Apartments’ Federation (BAF) which represents over 70,000 apartments, spoke about the need to generate consciousness about water preservation among citizens. They also spoke about ensuring rooftop solar power plants, waste management and water solutions across the city. Whitefield Rising (WFR), a civic group, shared its conscious and sustained efforts to rejuvenate lakes in Whitefield and to organize workshops on water management. They also emphasised the need to reuse water and to set up Sewage Treatment Plants (STPs) in the area. Meera K, Co-founder of Citizen Matters, talked about the need to engage knowledge partners and citizens in conversation as well as in finding solutions. She talked about technologies and design approaches to reduce water consumption, and communication strategies to raise awareness. Biome, an environmental Trust, narrated the stories of well-diggers in the city. The community is a repository of knowledge on the hydrogeology of Bengaluru. Biome emphasized on limiting citizens’ demand for water since relying on the supply side was not a sustainable solution. Representatives of Beautiful Bengaluru, an initiative to make the city cleaner and greener, highlighted the importance of individual contributions towards saving water before seeking solutions outside. The theory of ‘Ecowaternomics’ was discussed thoroughly. It looks at the economics of using less water from two angles – using less and reusing more. Beautiful #Bengaluru is a community initiative to make our city cleaner, greener & safer by using as little #water as possible in our daily activities. Subsequently, there were two panels organized on water metering and pricing, and STP technologies. These panels included representatives from apartment complexes and RWAs. They shared a three-pronged strategy of installing water flow meters, reusing treated water from STPs and setting up rainwater harvesting systems in gated communities. Ekta Sawant is a student of Azim Premji University. As if persistent warning bells were not enough, in a new study, city based geologists are showing that the region’s groundwater table may be sucked dry soon, and over 2.4 million citizens may be stranded. Panic seems to have hit the administration, with everyone from the state government to the BWSSB to the corporators getting onto a borewell-drilling spree. Water is most important basic need of population. I am sorry that the nequired attention to solve this problem is not given by successive Goverents. Taking into consideration of the fast growing population BWSSB should plan and start executing the same under strict time frame Rain harvesting is just a joke, to satisfy the false planning. Ground water to our well is driedup long back. Now it is used for collection of rain water as planned by Government. Which is also dry. At Koramangala, we get Cauvery water just for few hours on alternate days ! Awesome! its high time that we realise where all we are going wrong with our water management.